Greek manufacturer, and president ("proëdros") of the Jewish community of Athens, Greece. He was born at Zante in 1865. After receiving an elementary education in his native city, he studied at Paris, where he took the degree of doctor of science, and graduated as engineer at the Ecole Supérieure de Télégraphie. He was at first in the employ of the Société Edison of Paris, and afterward in that of the Société d'Entreprises of Athens, in which city he constructed, in 1887, the first electric-lighting establishment, thereby greatly contributing to the popularization in the Greek peninsula of the most recent discoveries in electricity and telephony. A commission and banking business which he founded has, in less than thirteen years, taken the foremost position in the commercial and industrial affairs of Athens. The emery trade of the island of Naxos is a state monopoly managed by the firm of A. Constantinis, which exports three-fourths of the emery consumed in the world. In recognition of Constantinis' services the Greek government appointed him secretary of the commission in charge of the Athens exhibit in the Paris Exposition of 1900. 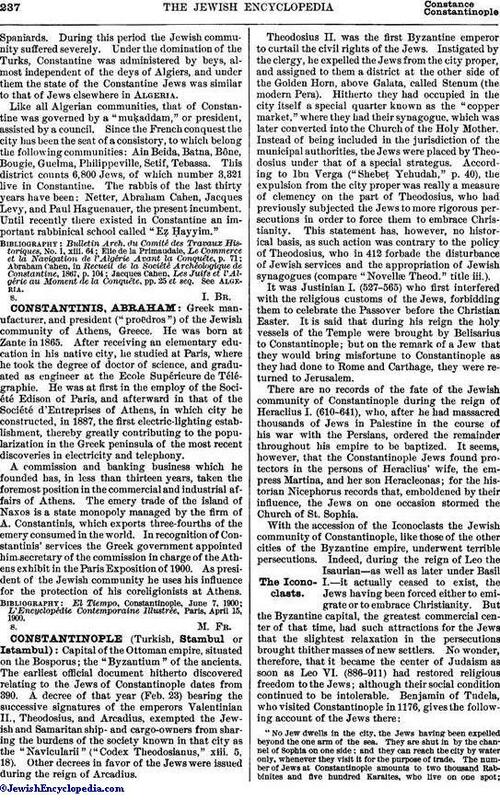 As president of the Jewish community he uses his influence for the protection of his coreligionists at Athens. L'Encyclopédie Contemporaine Illustrée, Paris, April 15, 1900.